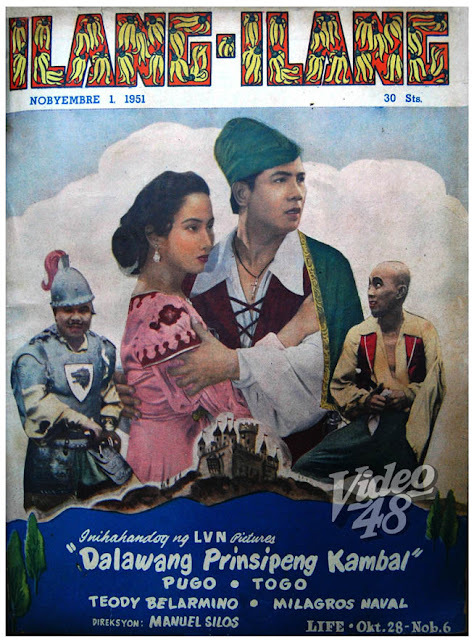 Screen legend Rogelio dela Rosa played dual role in this exciting costume movie, as Felipe, a shipyard stevedore and as Haring Cobra, the deposed king. 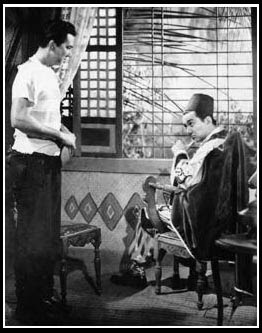 The scheming Haring Cobra hired the services of Felipe, his look-a-like, to double for him and devised a plan to reclaim his throne. Director Richard Abelardo, known for his terrific and superb camera works and visual effects, was able to put the two characters in a single frame perfectly. 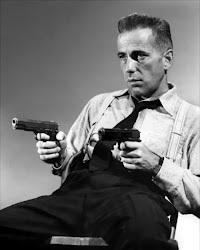 One wonders how he did it given the crude movie equipments he had during that time. 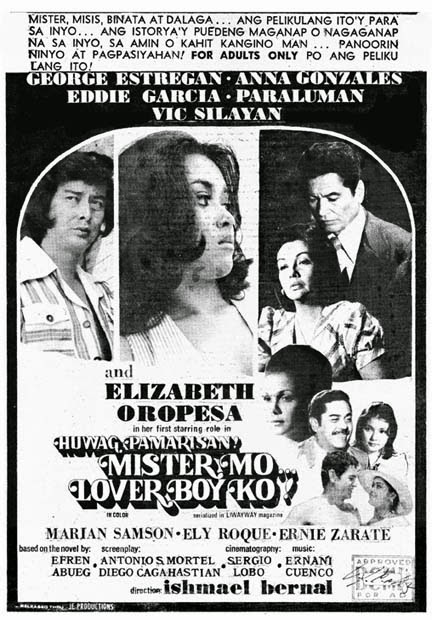 The Story--- While working in a shipyard in Jolo, Felipe (Rogelio dela Rosa) is coerced by two henchmen of a deposed monarch, Haring Cobra, to accept a twofold mission - to impersonate him and kill the present usurper to the throne, his cousin, Rahmed (Jose Vergara) and thus stop the forthcoming marriage of Rahmed and the lovely Amahda (Lilia Dizon). 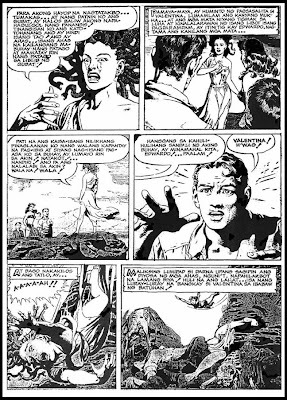 In a short flashback, Haring Cobra relates the events that led to his overthrow - how he was betrayed by Rahmed and together with his loyal aides, set upon a raft and left to drift aimlessly at sea; how he lost his right arm and instead of a hand, now has grotesque sharp steel claws (see clip below). 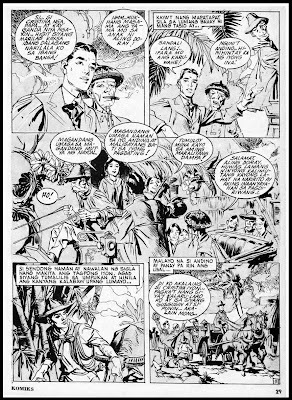 The adventurer Felipe is intrigued by the prospects of a huge reward, and the chance of meeting Amahda. 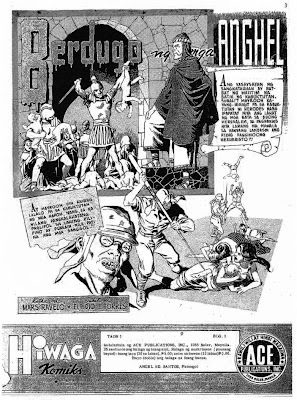 He receives a thorough training in impersonating Haring Cobra, including the trademark smirk that the deposed King is famous for. 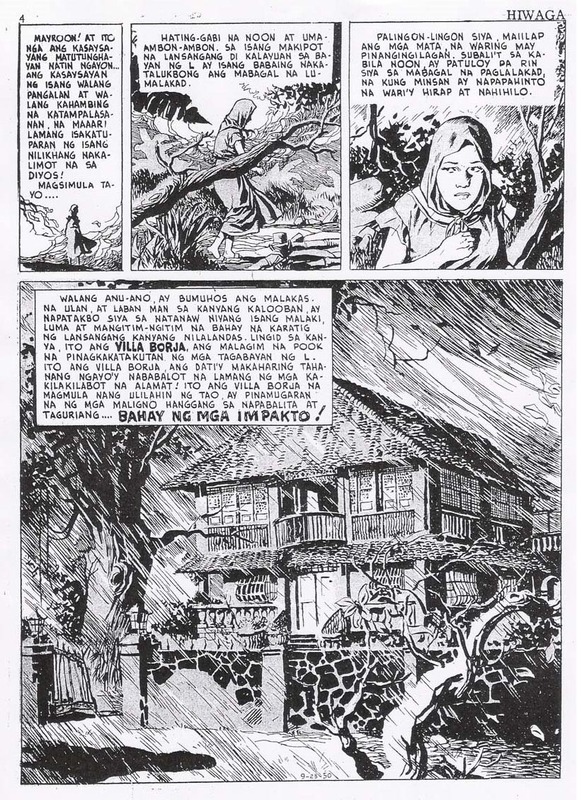 Arriving at this Balinese-type island not far from Jolo, Felipe, now as Haring Cobra, is smitten by the beautiful Amahda, who also feels an attraction to a man she knows to be an impostor. 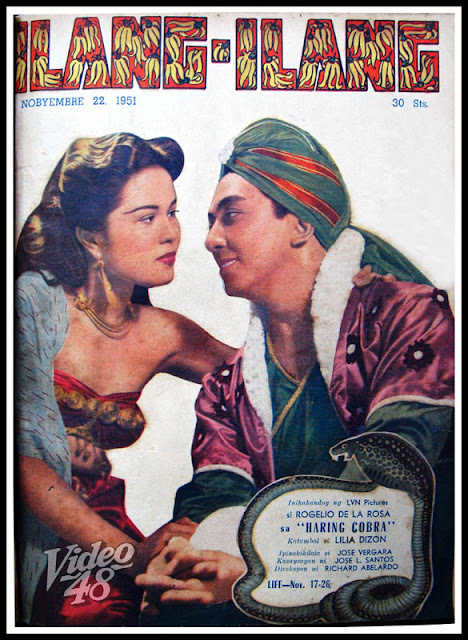 Rahmed is also in love with Amahda, and wishes to make her his queen, but Felipe (as Haring Cobra), upon meeting Rahmed, is told another version of events that led to Haring Cobra's overthrow. 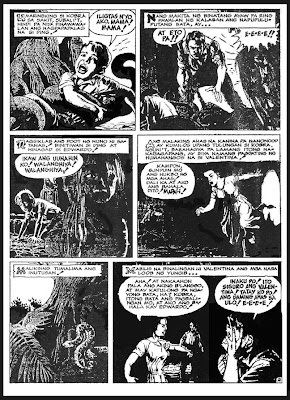 Haring Cobra was the usurper, who grabbed power from his own father, Razul, and killed him. 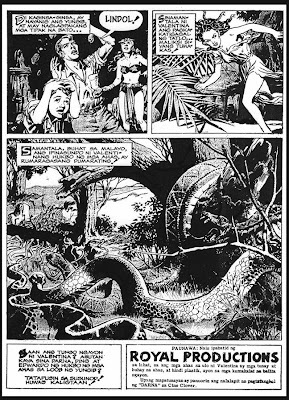 But only Haring Cobra knows that Razul is not dead, but locked up in the ruins of an ancient temple. Felipe is confused by the turn of events, but nevertheless engages Rahmed in a swordfight. 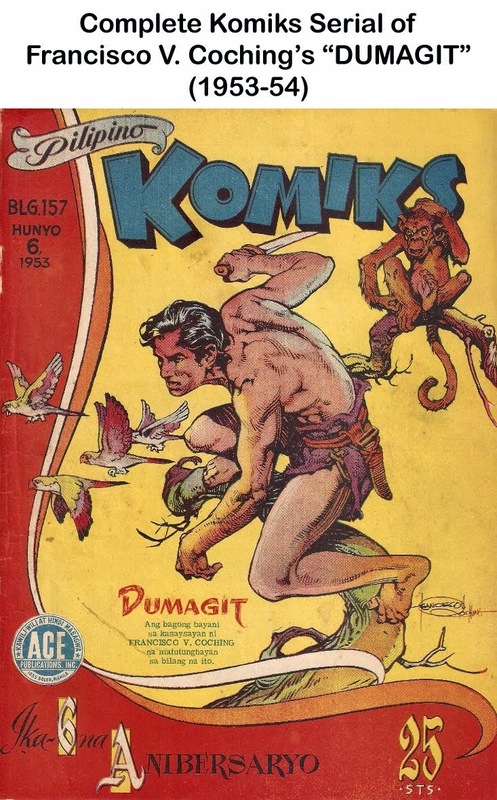 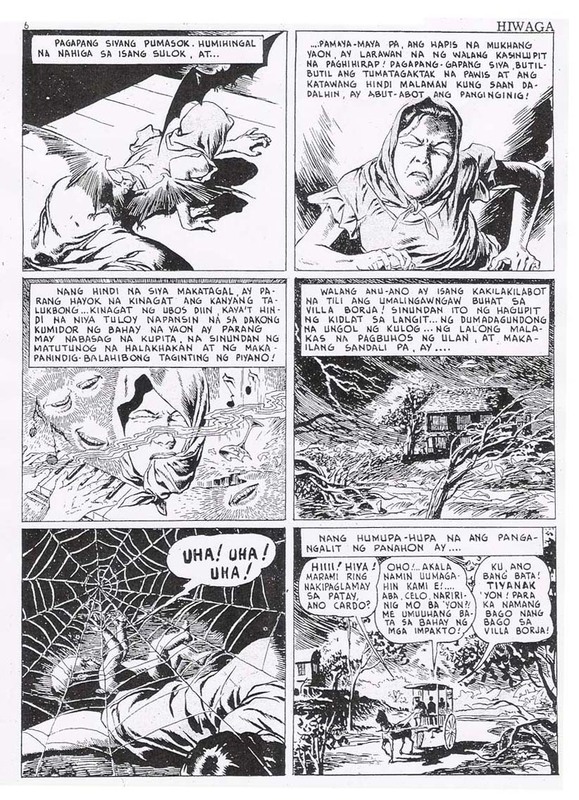 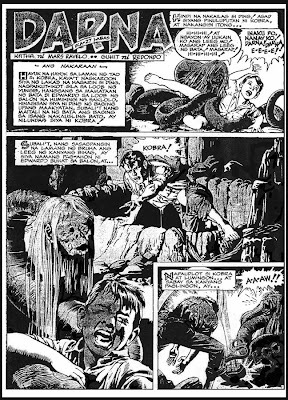 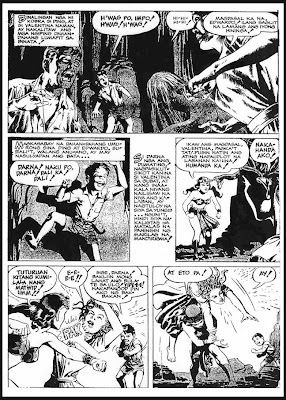 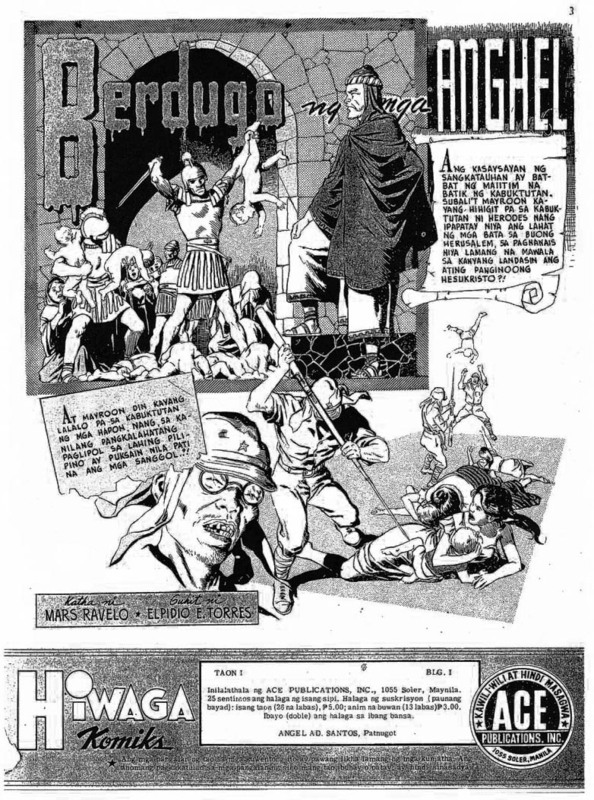 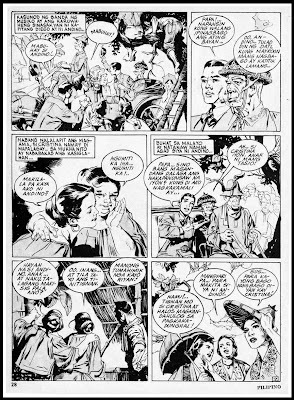 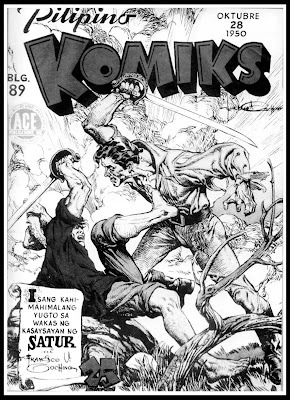 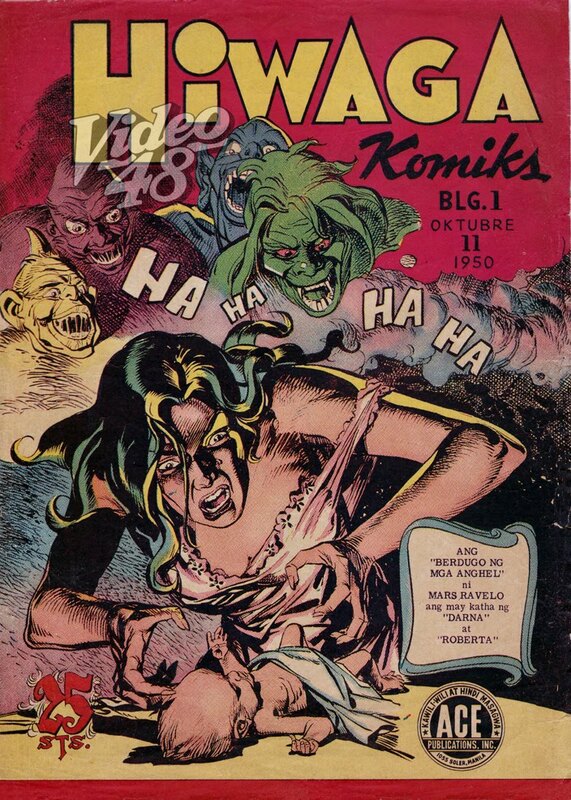 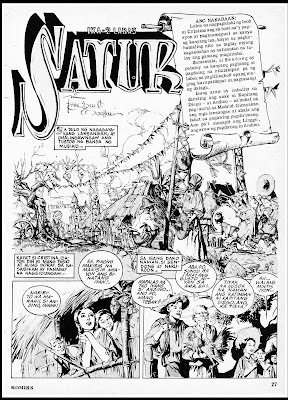 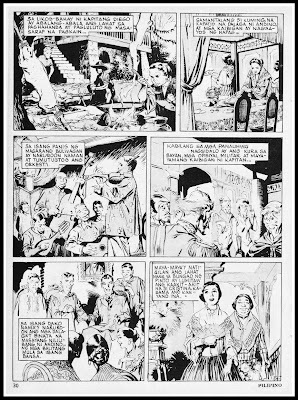 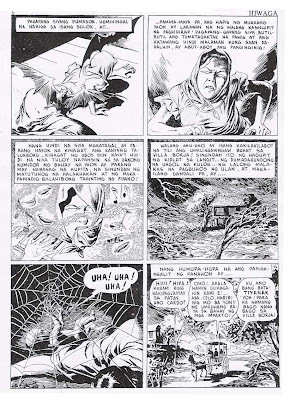 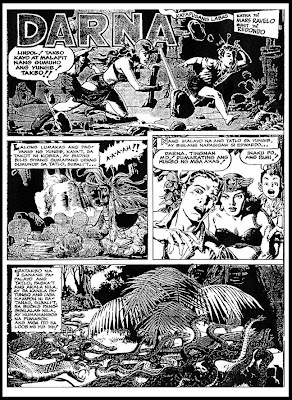 Satur, created by Francisco V. Coching, appeared on the pages of Pilipino Komiks in 1950. 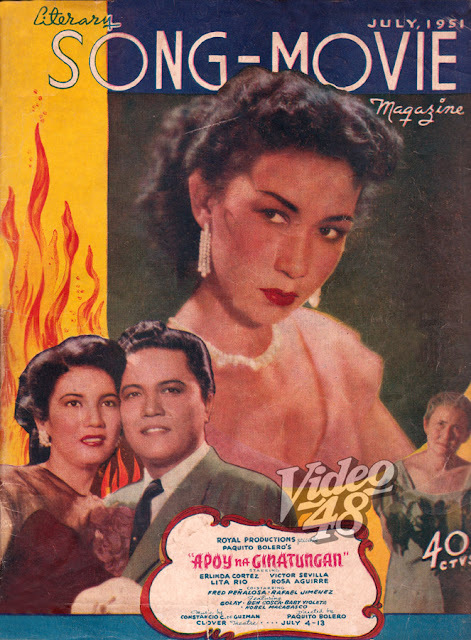 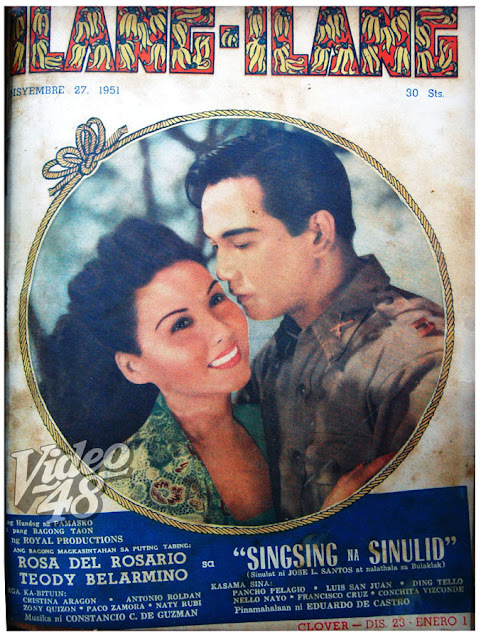 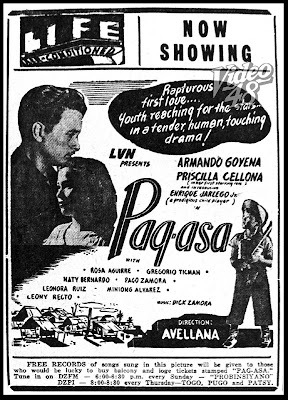 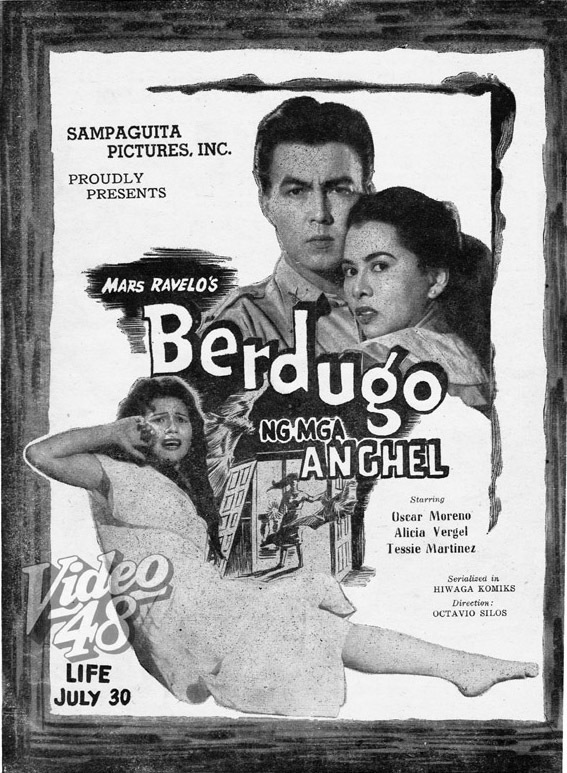 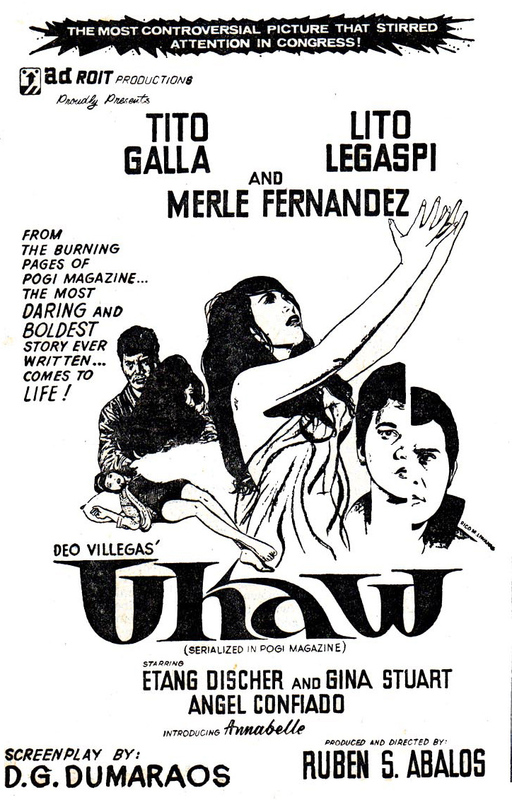 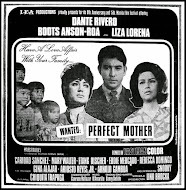 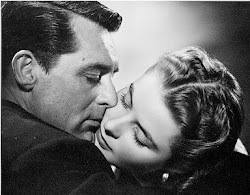 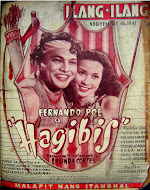 It was adapted for the screen by LVN Pictures in 1951 under Lamberto V. Avellana direction. 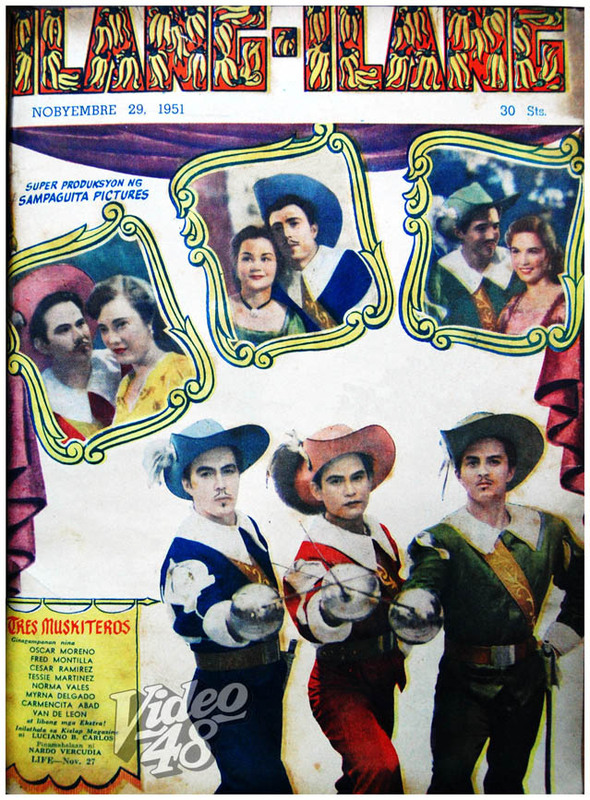 Manuel Conde played the title role of Satur, the devil incarnate and masquerading as a handsome, dapper young man in cape. 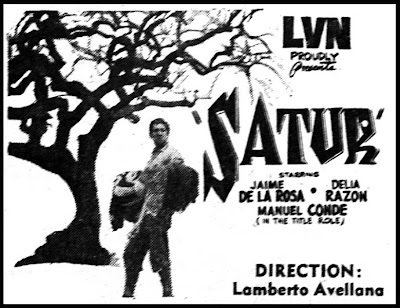 Satur (played by Manuel Conde) was a handsome, wealthy, mysterious, young man who will give anything to the woman he loved. 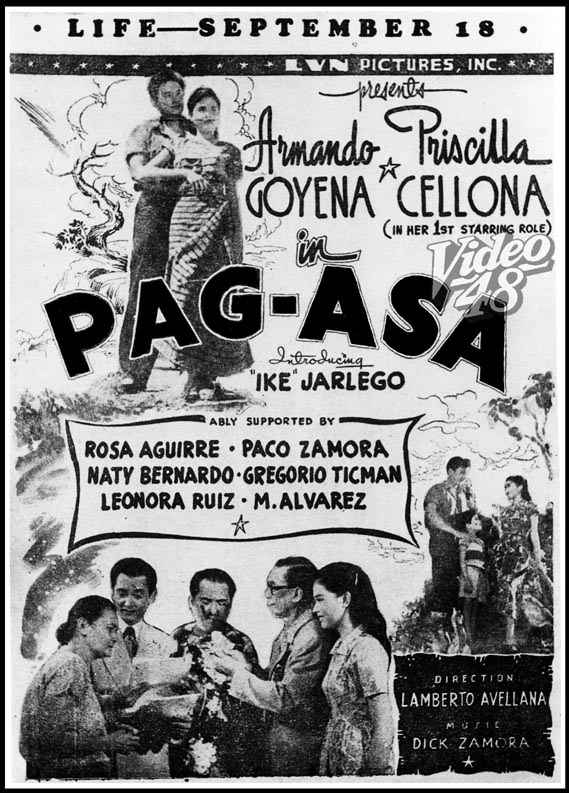 It was Cristina (Delia Razon), a pretty barrio lass, whom Satur wanted for his wife, but the young woman was already committed to Sendong (Jaime dela Rosa), a farmer. 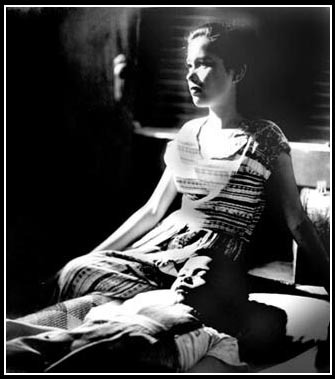 When Cristina’s mother fell ill and no cure can be found, Cristina went to Satur for help. 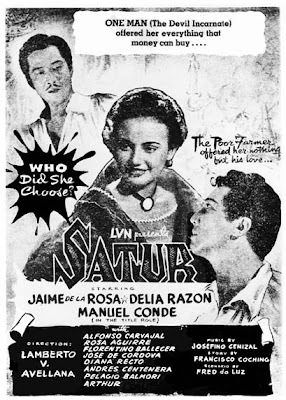 A written contract or pact was signed and consummated between Satur and the family, wherein Cristina will be forever indebted to Satur. 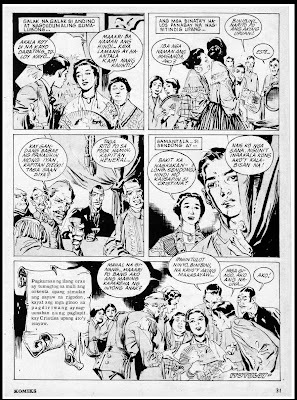 The mother got well. 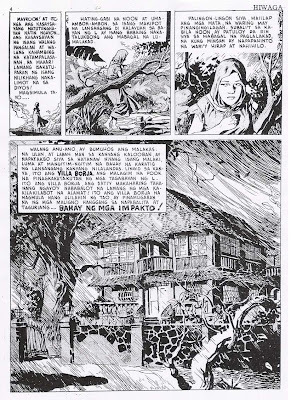 Later, Satur left town and entrusted all his wealth--- the mansion and everything to Cristina and her family. 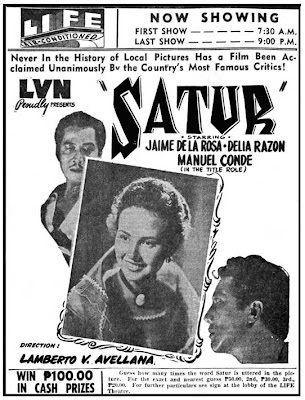 When the family learned that Satur died, they thought that the deal they entered to was already void with his death. Cristina went to Sendong to tell the good news. 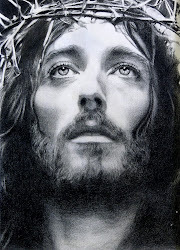 But Satur was not any ordinary human being; he was the devil incarnate disguising as a man. 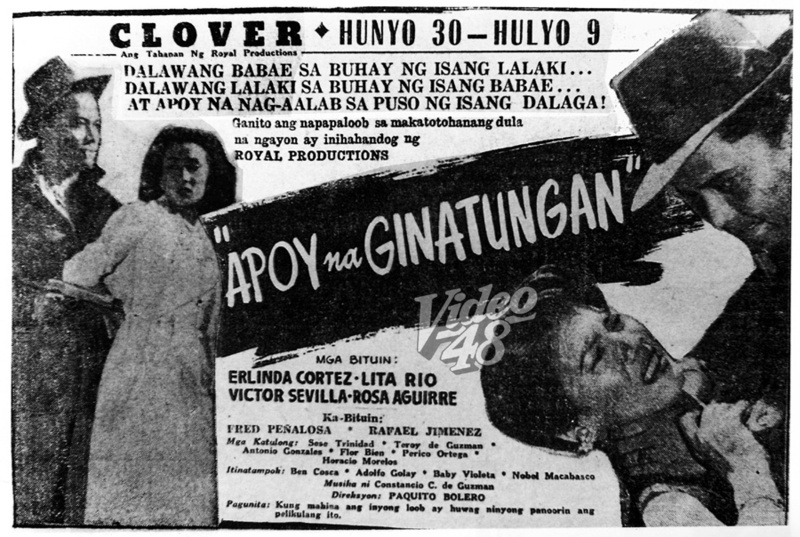 A deal is a deal--- and Satur insisted that Cristina was his forever. 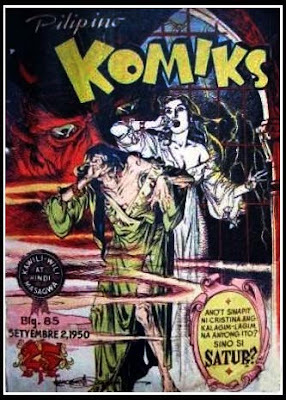 When the contract was not met, a curse was hurled on Cristina turning her into an old woman. Sendong will try anything to save Cristina, even at the expense of his life. 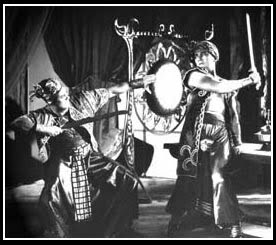 The duel to the end with Satur was his only chance. 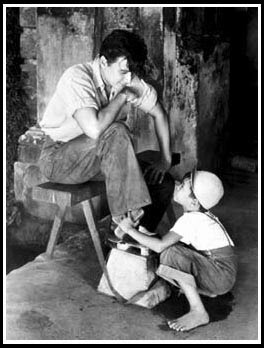 An incredible and impossible task to do! 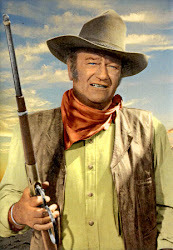 Can he make it? 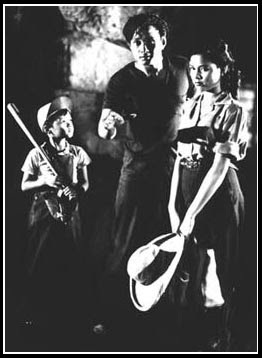 Recently orphaned, Celing (played by Priscilla Cellona in her first starring role) and her robust and playful kid brother Piding (Ike Jarlego Jr) went to Manila to find work in the home of their late parents' hacienda landlord (Paco Zamora). 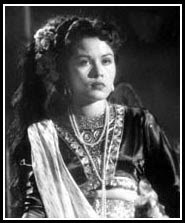 However they were treated miserably by the landlord's ill-tempered second wife, Doña Esperanza (Naty Bernardo). 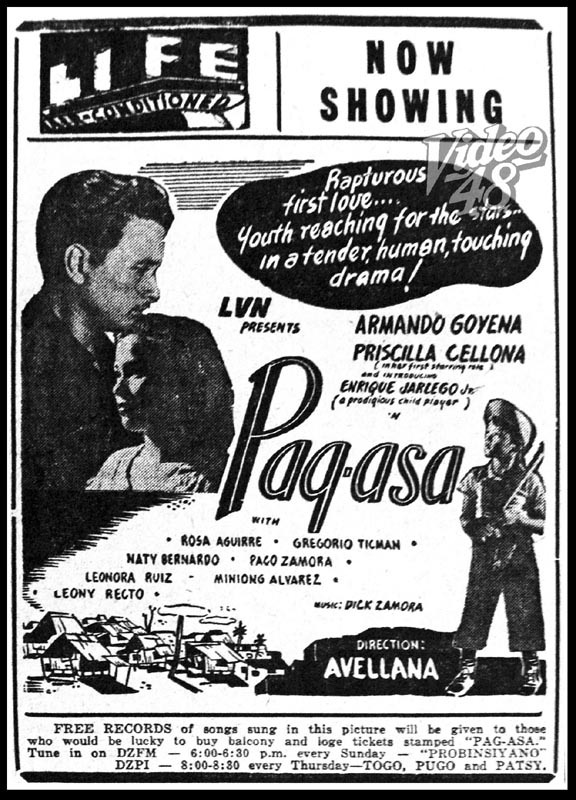 Physically abused and beaten, Celing and Piding ran away one night and ended up in an amusement park where they met Victor (Armando Goyena), a ferris wheel operator. 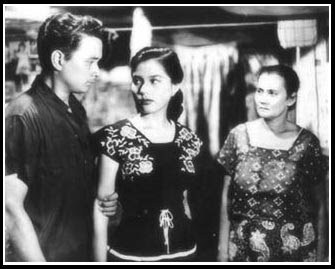 Victor took pity on them and brought them home to his mother, Aling Teria (Rosa Aguirre). The old woman welcomed the two with open arms. 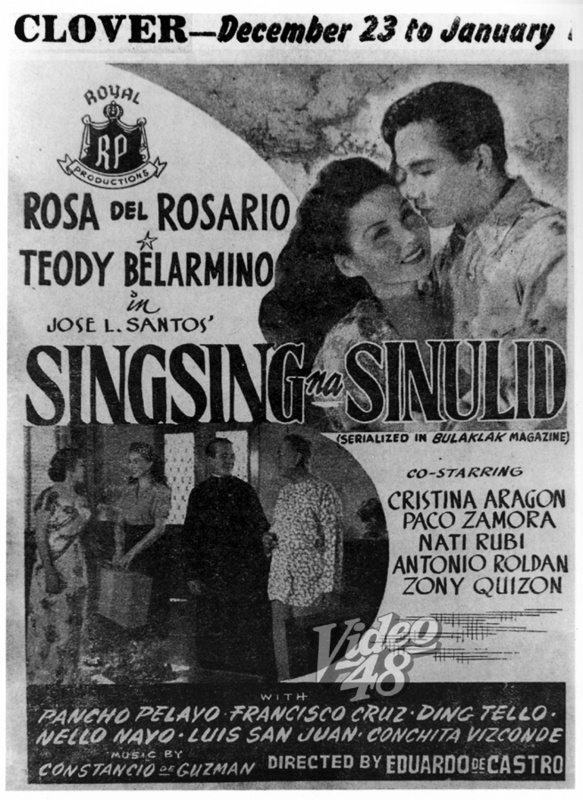 Celing, who happened to have a good singing voice, was persuaded by Victor's uncle, Mang Sebio (Gregorio Ticman) to join an amateur radio singing contest. 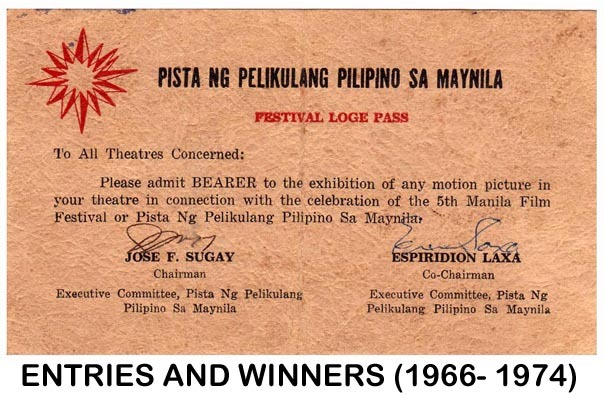 She won and it became the start of a very successful singing career. 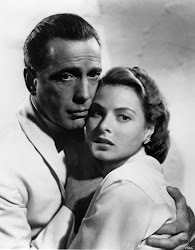 However, her new good fortune brought her no joy because Victor pretended not to care about her at all. 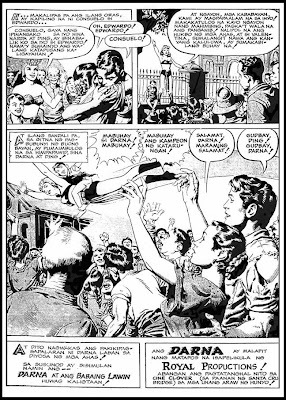 Celing was secretly in love with Victor and the young man addressed her as "kid." 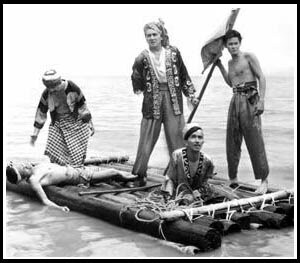 On the other hand, Victor and Piding became fast friends. 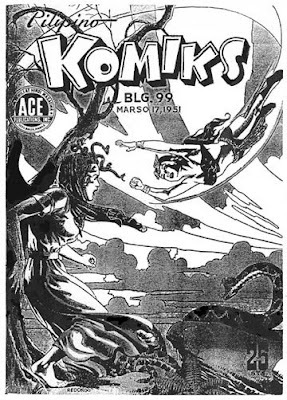 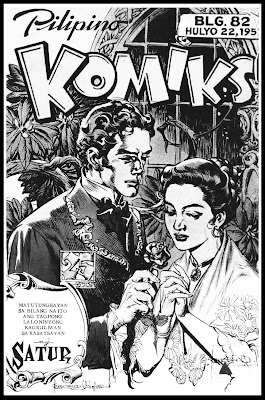 It's good over evil, as the final two installments of Mars Ravelo's highly charged komiks serial novel, Darna (1950) comes to a climatic end. Hayuk na hayok sa laman ng tao si Kobra, kaya’t nagkaroon siya ng lakas na hagarin si Ding. 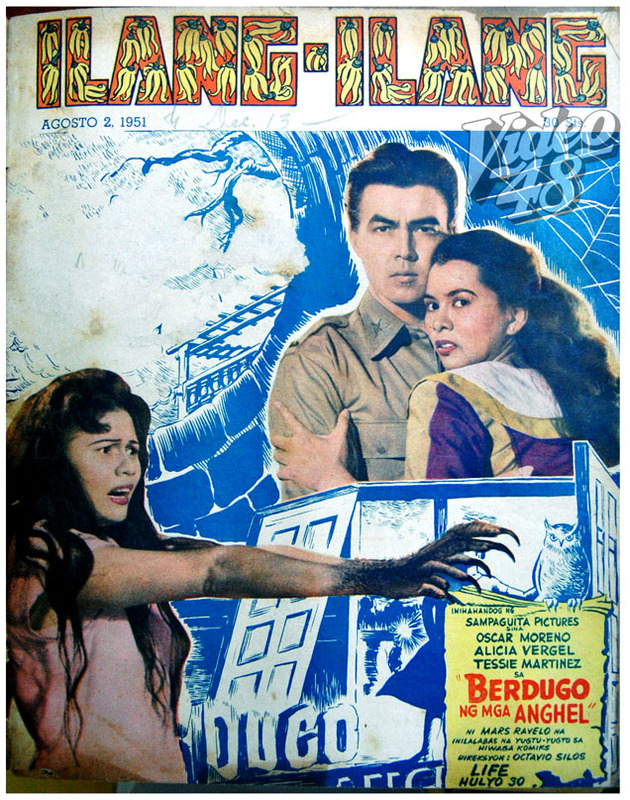 Nagpaikut-ikot sila sa loob ng yungib, hangang sa mamataan ng bata si Edwardo sa loob ng balon na humihingi ng saklolo. 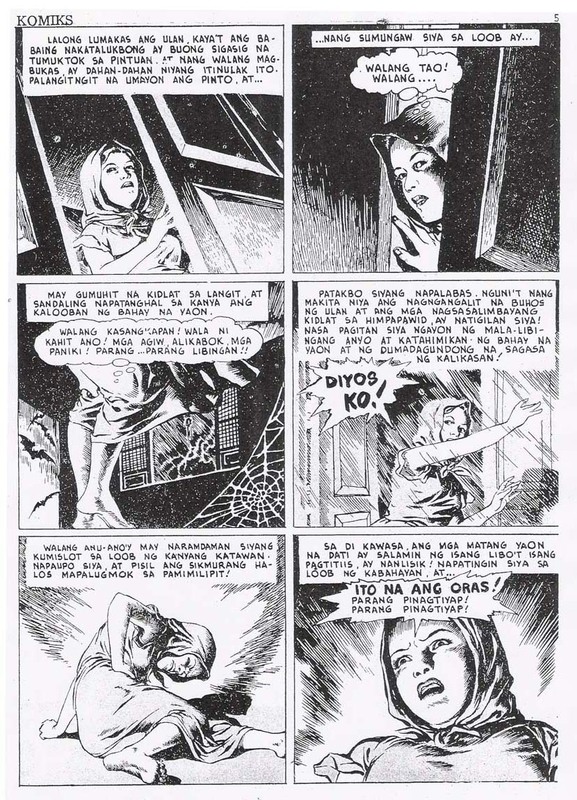 Hinagisan siya ni Ding ng baging upang maakyatan, subali’t nang maitali na ng bata ang baging sa isang nakausling bato, ay nilundag siya ni Kobra.